My neighbour went on a week’s barge holiday and came back with bags of bounty – apples and pears (scrumped, I believe, from the gardens backing onto the canal), sloes and Spanish chestnuts. So this week I’ve been pickling and preserving and generally feeling deeply satisfied whenever I open my larder door and see the rows of pots and jars and bottles blinking back at me from the gloom. The mustard-yellow piccalilli doesn’t look that appetising, but Delia assures me it goes very well with cold meats. The sloe gin (patience, patience) looks rich and syrupy, the berries piled at the bottom of the bottle like dewy marbles. But it’s the apple and pear chutney that I’m most pleased with. Spicy, sweet and gingery, it will be the perfect partner for a hunk of cheese. 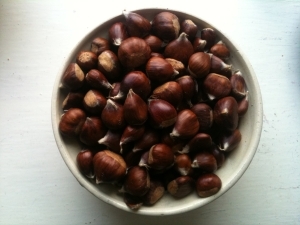 Roast them, make them into chestnut liqueur or save them for stuffing? And up at the back of the cupboard, gathering a cobweb or two, are four bottles of elderflower champagne that I made back in June when the flowers were frothy and warm with sunshine. I’d completely forgotten about them. That’s what I love about preserving – the alchemy of capturing a certain time, a certain place. When we crack open the elderflower champagne at Christmas, we’ll get a mouthful of summer, as fragrant and soft as a warm breeze. It will be a reminder of what’s ahead. 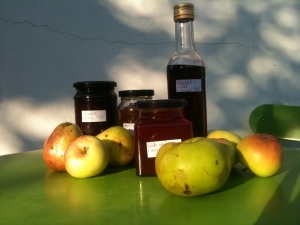 In mid winter, the crunch of the apple in the chutney will trigger memories of a mellow autumn, ripe and delicious. And the sloe gin, well it’s just the nectar of the gods as far as I’m concerned. There’s a thrifyness that I like too; the using up of seasonal abundance. And it makes me think of a contented kitchen. The sweet sharp smell of the bubbling fruit and sugar fills the house and makes it a home. It has the added bonus of makes Christmas presents very easy and cheap. Yes, this year you might just be getting a jar of piccalilli. Put everything in a big pan and bring it to boiling point, stirring constantly. Then simmer it for about an hour, stirring a bit. Pot it all up and label. I sterilise my pots by washing them in hot soapy water and then putting them in a medium oven for ten minutes just before using them. I then tend to burn my fingers at least once as I juggle hot jars and boiling chutney.